The hotel is located on a very remote island in the middle of the Indian Ocean, with key project challenges including extreme weather conditions, the beachfront location and local contractors who spoke no English and had never used Outdure products before. All products had to be quality approved by the Starwood Hotel Group before they could be installed in the beach pavilion. Outdure worked with the Starwood Group to design the deck area. 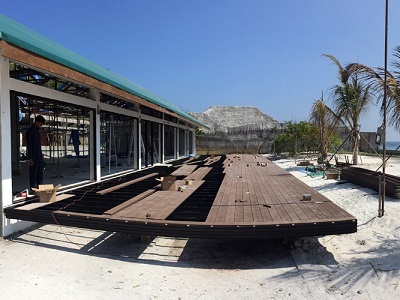 Given the remote location of the hotel, Outdure prefabricated the frames and shipped them to the local port in Male. The goods were then barged to the island and installed by local contractors. The 240-square-metre deck was completed in eight days with the framing installed in three days and the decking boards taking another five days. The entire project was completed with minimal disruption to guests and at a low cost. Comprehensive installation guides were provided to ensure smooth execution of the project. Minimal posts and concrete were required due to the long-span capabilities of QwickBuild. Outdure’s QwickBuild modular framing system with marine-grade fasteners and Outdure moisture-resistant EcoDecking were selected for their ability to withstand the challenging conditions.